patients Our only priority is your child’s health – that’s why parents count on Children’s Physicians Medical Group. In partnership with Rady Children’s Health Network, CPMG brings you the most comprehensive pediatric health care in San Diego County. We’re the region’s only pediatric medical network specializing in children’s health. Dr. Jaime Friedman is a pediatrician and the lead physician at the 4S Ranch location of Children’s Primary Care Medical Group. of friends. It’s important to talk to your camper before they leave about any concerns they may have. A trip to the pediatrician for a pre-camp checkup, immunizations, and medication check is also a good time to talk about any anxiety concerns. The camp health staff is also responsible for ordering appropriate medications to keep in stock, reviewing camper medications, and making sure campers get the medications they arrived with. This also includes a review of any allergies so that the counselors can be informed and the camp can be prepared. By the end of the week, all of the campers have become like my own kids. I remind them to wear sunscreen and drink lots of water. I eat meals with them, watch them at their activities, and fix what ails them. And then we are all even more prepared to return to practice our “real” lives at home – until next summer! Get to know SanDiegoFamily.com, where you’ll discover a plethora of awesomeness for parents. For the Kids: Crafts for Kids • Elegant Foam Easter Eggs 16	Tips for Sending Shy Kids to Camp Summer camp isn’t just for social butterflies! Can’t find what you’re looking for on our website? Enter key words in the search bar and browse our list of articles. Find contest prizes for this month on page 45. Receive 12 issues for $18, plus our annual publication, Out & About. Orders must include payment to San Diego Family Magazine. Mail to: SDFM, Subscriptions, 1475 Sixth Ave., Fifth Floor, San Diego, CA 92101; or call 619-685-6970 to use a credit card. Family Feedback “San Diego Family is a community resource for both advertisers and local families. We specialize in connecting the two,” says Publisher, Sharon Bay. We get so busy gathering and disseminating awesome information to the San Diego community that we often forget to sit back and say, You know, we’ve been doing this for a while and that’s really cool! So, this month (our birthday month), we’re dedicating our staff page to a roundup of positive feedback we’ve received and a few interesting things that were happening 37 years ago when San Diego Family was “born” as a newspaper-style publication. When Sharon Bay took the publication over in 1985, she ran the business and assembled the magazine at home, thinking it would be a fun part-time job (she was told it would only take 15 hours per week). Ha! Did you know? 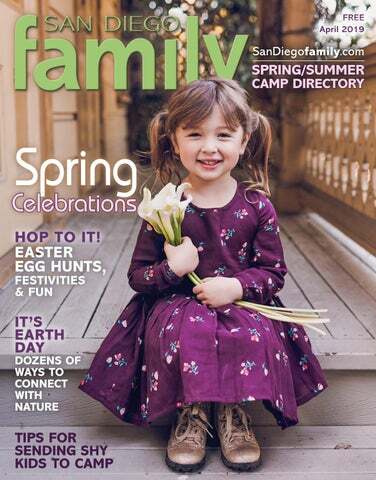 San Diego Family Magazine highlights fun and fabulous activities for local families, parenting articles, and tons of great information through three print publications, two websites, Facebook, Instagram, Twitter and Pinterest. “We’ve changed a lot over the years, but our goal is to always to be THE resource for San Diego County families,” says Bay. Main Office: 1475 Sixth Avenue, Fifth Floor, San Diego, CA 92101 • Phone: 619-685-6970 Fax: 619-685-6978 • Email: family@SanDiegoFamily.com Mission Statement: To enhance the quality of life for San Diego County families by providing information and resources that support the importance and pleasure of parenting. Scuba Bunny is bounding into the aquarium to help us celebrate the arrival of spring and the changes it brings during Eggstravaganza! • Explore animal eggs included with • Create a shark egg craft • Scuba Bunny-themed dive shows admission (see website for days/times) • Participate in an “underwater egg hunt” — no basket needed! Don’t miss extra activities, encounters, and more! Lisa Gipson Be a Superhero for Autism! Grab your cape and run or walk through the heart of Balboa Park in the San Diego Race for Autism Superhero 5K, presented by National Foundation for Autism Research (NFAR). The event helps kick off Autism Awareness Month and includes a resource fair, children’s activities, music, capes for kids, prizes, refreshments and more. Costumes and strollers welcome. Mark your calendars for Saturday, April 6; 5K starts at 7:30 a.m.; one-mile Family Fun Walk starts at 8:30 a.m. All race donations support San Diego autism programs, services and local classrooms. Get all the details and register at www.raceforautism.org. Allergy-Free Easter Eggs Ever heard of Eggnots? They look and feel like eggs, but are an ecofriendly, ceramic product that is safe for families with egg allergies — and perfect for crafters. Create one-of-a-kind Easter eggs that last using paint, dye or markers, and embellishments. Learn more at www.eggnots.com. Congratulations 2019 Cover Kids Winners! We had so much fun meeting 100 fabulous Cover Kids Search finalists (and their families) at our recent event! Each winner will appear on a future cover of San Diego Family Magazine or our annual publication, Out & About with Kids. See photos of all finalists at www.sandiegofamily to our .com/contests/cover-kidssearch-winners-finalists. Thank you to our partners Thank you to everyone who entered this year’s contest! A portion of the proceeds is donated to the Special Needs Resource Foundation of San Diego. A huge thank you The Natalia, Age 2-4 McKean, Age 2-4 New Children’s Museum Dominic, Age 5-7 5-7 Thom, Age of San Diego for hosting the event for our finalists, and to Cover Kids Search sponsors: G3kids, Tower Talent, Fleet Science Center, Ava Grace, Age 8-11 Sophia, Age 8-11 Country Montessori School Look for them on future covers of San Diego Family Magazine!!! and realtor, Silvia Vasquez. aren’t just for social butterflies. If your shy kid has expressed worry about attending camp, invite him to keep an open mind. Camp offers many opportunities for growth and friendship. Chances are you’ll both be glad you gave it a try. Shannan Rebold encouraged her 12-year-old son to attend camp last summer, even though he was anxious about making friends. “He warmed up with the encouragement of awesome camp counselors,” she says. He had a blast and looked forward to returning to camp each day. Here are tips for an apprehensive child’s first camp experience. There are amazing rewards once the nerves have been conquered. Scholarships and 10% sibling discounts available! Register early and reserve your spot for the first week of camp! Register Online Today! May 22 10 am – 8 pm June 8 9 am – 11 am Weekly Rate: $95 Day Drop In: $25 Lunch and Snack Included! before the first day. The sooner he starts flexing those friendmaking muscles, the better. PAUSE. TAKE A BREAK. RELAX. HAVE FUN. in mind that children must overcome challenges in order to grow. Rebold believes her son learned something important about himself after he took (what felt like) a risk and went to camp. “He discovered that he can put himself in situations like that and survive,” Rebold says. “He was proud of himself for developing friendships and loved that the campers all had similar interests.” His positive camp experience helped him adjust when the family moved to a new state last year. It gave him confidence to make new friends and collaborate on projects with new classmates — just like he did at camp last summer. offers excellent opportunities for kids to practice making friends. Most camps have themes that bring diverse groups together to explore common interests (sports, theater, science, etc.). Conversation tends to come easier when surrounded by likeminded people. Imagine a place where a child can gush about a new coding program, outdoor skill or favorite musical while fellow campers nod in exuberant agreement. The camp environment also includes a wide range of ages, which facilitates interaction between older and younger children. Sometimes it’s easier for a shy kid to make a friend outside his grade level. Camp is the place to do that! v Anne Malinoski is a contributing writer and mother of two boys. She spent her childhood summers at CYT camp and her college summers as a counselor. + 7 other camps for kids facing adversity Did you know that over five million kids nationwide have been impacted by a parent’s cancer? Many others are facing adversities such as death of a loved one, their own cancer diagnosis or family substance abuse. Camp Kesem and other organizations offer a reprieve for local kids in tough situations — free summer camp experiences in specialized, nurturing environments. June 17-23 and Aug. 4-10 Irvine Ranch Outdoor Education Center in Orange, CA Camp Kesem’s San Diego chapter partners with UC San Diego. All volunteers are UC San Diego students who are carefully screened and trained — many have had a parent or family member with cancer, too. More than 200 local kids attended the local camp last summer. Location varies year-to-year throughout Southern California, but transportation to camp is always provided from UC San Diego’s main campus. For more information, visit www.campkesem.org. Camp Spero Alumni Camp Returning campers combines July 26 – 28 grief-related activities with traditional camp fun. WWW.LILFISH.US • FOLLOW US ONLINE! cancer when I was 4 years old,” says Sarah “Sunrise” Sodeika, a camp counselor and former camper. “I was only 8 when I started going to camp, but already understood how special it was to find a place to connect with kids going through the same experiences.” She hasn’t missed a single year of camp since. What does “Sunrise” think of Empowerment? “We hear a lot about how Kesem means ‘magic’, ‘family’, ‘home’ and ‘love’ to these campers. There are a lot of tears and tissues, but you genuinely feel the love and support in that room. You always leave Empowerment feeling lighter than before; I think it’s the most important part of camp because it reminds campers that their feelings are valid, and they have the power to help other kids going through the same experience.” If that sounds a little heavy, keep in mind that Empowerment is just one event out of a whole week filled with fun activities. There is no pressure to participate, but parents might be surprised by their child’s warm response to the experience. Perhaps the real magic behind Camp Kesem lies in its passionate volunteers. “Lux” and “Sunrise” are just two of 5,000 college student volunteers across the country behind the phenomenal organization. Volunteers raise funds, increase community awareness, plan camp activities and provide counseling as camp leaders. Camp Kesem has more than 100 regional chapters, and welcomed almost 9,000 campers last year. v Lisa Pawlak is a 3-time cancer survivor, who lost her own mother to cancer. Her son “Rogue” attends Camp Kesem. Best. summer. ever! CRIPPS PERFORMING ARTS musIcal SACADEMY Official School of the Scripps Ballet Theatre theatre camps Chillin’ Like a Villain! (Ages 3.5 – 7) This Musical Theatre Camp will have your child singing and dancing to their favorite songs from Disney’s the Descendants 1 and 2. We Will Rock You! (Ages 3.5 – 7) We love Rock and Roll here at SPAA and can’t wait to have our very own Rock Concert! Practically Poppins! (Ages 8 – 12) Students will be “Stepping in Time” while experiencing all aspects of musical theatre. Broadway Remix (Ages 8 - 12) Students will experience working on scenes and songs from Musicals that are currently on The Great White Way! Ages 9-19 Contact Us for Details! Make Your Own Music Videos (Ages 9 & Up) Your camper will feel like a STAR making a Music Video from start to finish!!! Improv-I-Nation! (Ages 10 & Up) This camp is ALL IMPROV! Through the use of theatre games and scene work, campers will experience all aspects of Improv, the act of coming up with material from the top of your head. Musical Theatre Conservatory (Ages 12 & Up) This intensive focuses on honing the technique of musical theatre performance through choreography, scene/script analysis, and monologue work. health and wellness achievements at school. Every Kid Healthy events promote healthy eating, nutrition education, physical activity and physical education. But health and wellness starts at home! It’s important to maintain good overall health so children grow and develop appropriately. Here are seven ways to promote healthy habits at home. Create a Bedtime Routine. National Institutes of Health (NIH) recommends school-age children and teens sleep 9–10 hours per night. One way to ensure your children are receiving enough sleep is to set bedtime based on when they need to wake up in the morning. Maintaining the same bedtime every night makes it easier to fall asleep and establish a healthy habit. Support the habit by starting the bedtime routine half an hour before the expected sleep time. Calming activities such as reading, taking a bath, drawing and listening to soothing music help children relax and fall asleep more easily. Receiving the proper amount of sleep promotes appropriate growth and development, improves learning and social interactions, and increases immunity against sickness. Studies show sleep deficiency increases the risk of obesity, heart disease, stroke and diabetes. Read Food Labels. Reading and understanding food labels helps children figure out which foods are healthier than others. Food labels indicate number of calories, sugar and fat content, and break down recommended daily intake to help create a balanced diet. It’s not uncommon to think a food is healthy, only to discover it isn’t after reading the label. Find free activities and printable worksheets to help children understand a balanced diet at: www.nourishinteractive.com/ nutrition-education-printables. 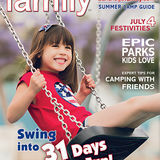 camps and programs in San Diego Family’s Summer Camps & Programs Guide. Project-based Tech Education for Kids & Teens Learn3D 3DModeling, Modeling, Coding, Coding, Artiﬁcial Intelligence, Robotics, Learn Artificial Intelligence, Robotics, Game Game Design, Design, Filmmaking, and more at pretigious universities in the US and Canada like Filmmaking and more at prestigious universities in the US and Canada like Stanford, Harvard, and UC San Diego. Stanford, Harvard and UC San Diego. Exercise with Your Kids. The Centers for Disease Control and Prevention (CDC) recommends children and teens be physically active for 60 minutes per day. Activities should include aerobic, muscle strengthening and bone strengthening. When parents and children exercise together — and choose fun activities — everyone is more likely to do it. Try walking, running, hiking, dancing, biking, or a workout class or online video. Create a weekly schedule, so it becomes a healthy habit. Childhood obesity has both shortand long-term effects on a child’s physical, social and emotional health. Make a point to help children to maintain a healthy weight. Get more ideas in the article “Fun over Fitness: Focus on Family Playtime” at www.sandiegofamily .com/health-guide/fun-overfitness-focus-on-family-playtime. Limit Screen Time. Screen time consists of watching TV, playing video games and using electronic devices. When children are glued to screens, there is a host of potential social, emotional and physical problems. For instance, a research study at UCLA found when kids have too much screen time, they have difficulty reading other people’s emotions. That’s likely because face-to-face interaction is at an all-time low and kids aren’t learning important social skills. More and more evidence of the harmful effects of excessive screen time is still being uncovered — it impacts everything from behavior and attention span to weight and cognitive skills — but it’s safe to say that limiting screen time has huge benefits. WWW.TOPDOGLiMOBUS.COM Are you ready for fun, adventures & field trips? Encourage Social Interactions. Encourage children to develop healthy relationships with peers and adults. Problem-solving, managing friendships and understanding emotions are necessary for positive mental health. These skills also help children learn more effectively in the classroom. Do you have toddlers who need social interaction? Read “5 Ideas for an Easter-Themed Play Date” at www.sandiegofamily.com/ seasonal-happenings. Discuss and Implement Safety: According to the CDC one of the leading causes of death among children is car accidents. One study found over 600,000 children did not use the proper car seat or seatbelt, which could prevent death during a car accident. Think about that! Use car seats properly and insist that children wear seatbelts. Learn more about car seat safety from Rady Children’s Hospital San Diego: www.rchsd.org/ health-articles/car-seat-safety. Implement safety practices to help prevent other potentially deadly situations such as drowning, fire/burns, guns, poisoning and suffocation. The San Diego Burn Institute offers tips for families and a free Fire Safe Kids presentation for schools. Learn more at www.firesafekid.org. Be a Healthy Role Model. Children and teens model their parents’ behaviors, whether positive or negative. Research conducted at Duke University found kids were more likely to eat well and exercise if parents modeled those behaviors. If you make healthy choices and establish healthy habits, your children will as well. v Cheryl Maguire holds a Masters of Counseling Psychology degree. She is married and the mother of twins and a daughter. Researching Age-Appropriate Books – The internet makes it easy for parents to research different book titles and authors, and find out the ratings and recommendations from family-friendly sites. Common Sense Media has a wealth of information on its website https://www. commonsensemedia.org/. It even has a list of “50 Books All Kids Should Read Before They’re 12” that includes classics such as “Charlotte’s Web” and recent best-seller “I Am Malala.” Include your child in the research to reinforce what you think is appropriate, and to narrow down your list to books that match your child’s interests. 5 Ways Technology Helps Grow Life-Long Readers One of the greatest gifts children can receive from their mothers is a love of reading, which takes them to new worlds, increases their vocabulary and communications skills, and helps them be more successful in school. Whether you’re reading to your child, or having your child read to you, books can help mothers and children bond and even learn more about each other’s interests and outlook on life. What better time than on Mother’s Day to share the joys of reading with your child. Here are some fun ways you can use technology to help grow life-long readers. when they understand what they’re reading. There are some great, free games on the internet that help kids of all ages (even teens) increase their vocabulary, including http://pbskids.org/games/vocabulary/ and http:// www.vocabulary.co.il/. place where you can stay for hours and never want to leave. Sometimes parents are strapped for time, and every minute counts. During those timestrapped days, the internet is the perfect way to go book shopping and add to your child’s library. E-Readers – Many readers prefer to hold a book in their hand, but for those children and teens who love technology, an e-reader is a good option for them to access titles and grow their love of reading. Watch Movies Based on a Book – So many classics and best-selling books have been turned into movies, and many of them are available on demand or by accessing your Netflix app through Cox’s Contour TV service. From “Bridge to Terabithia” and “How to Train Your Dragon” to a series like “Diary of a Wimpy Kid” or “The Hunger Games,” check your TV service’s on demand library to see what’s on. It’s fun to compare the book version to the movie, and discuss the similarities and differences. And don’t forget about seasonal movies such as “The Polar Express.” TV services such as Contour from Cox Communications offer an on demand library of thousands of titles, many in the “free on demand” library. And, if you have Contour’s voice controlled remote, you can simply let your child speak the title or a famous movie line into the remote to see if the movie is available. •	Pack a picnic and watch the clouds. •	Fly a kite. •	Surf, bodyboard, paddleboard or kayak. •	Walk barefoot on the beach. •	Make time for unstructured outdoor play in the backyard or a park. •	Go for a family bike ride. •	Go on a neighborhood walk and look for bugs, birds and fruit growing on trees. Notice different colors. •	Look at the night sky — find the moon, stars and constellations. •	Plant a container of flowers or vegetables, or find a community garden near you. •	Camp in the backyard. •	Play with mud and sticks. •	Find smooth rocks to paint. For 500 ways to connect with nature, check out Louv’s book Vitamin N: The Essential Guide to a Nature-Rich Life. Discover Earth Day events around San Diego County on page 46. Cherie Gough is a freelance writer and local mom of two. She’ll be looking for your inspiration on Instagram: #30x30naturechallenge and #GetOutsideSanDiego. Don’t forget to call to confirm dates, times and admission prices. Find an egg-citing trail of Easter happenings including egg hunts, bunny visits, Easter brunch options, crafts and more this month. Celebrate Earth Month (including Earth Day on April 22) with events that show our love for Mother Nature on page 46. Calendar • April San Diego Gulls Home Games. The team will play against Ontario Reign tonight at 7 pm, and against the San Jose Barracuda on April 10 at 7 pm. Pechanga Arena San Diego, 3500 Sports Arena Blvd., San Diego. For tickets and game times, visit www.sandiegogulls.com. Go, San Diego Sockers! Experience indoor soccer at its finest, and cheer for the San Diego Sockers as they play against the RGV Barracudas at 5:05 pm. Also, April 13, 7:05 pm (vs. Monterrey Flash). Pechanga Arena San Diego, 3500 Sports Arena Blvd., San Diego. For tickets, visit www.axs.com. monday | 8 “Superpower Dogs.” Don’t miss this IMAX adventure where you can witness the lifesaving superpowers and reBARKable bravery of some of the world’s most amazing canines. Showing daily; visit website for show times and admission. Fleet Science Center, Balboa Park. www.fleetscience.org Butterfly Jungle. See page 35.
wednesday | 10 Siblings Day Birch Aquarium’s Toddler Time. Delightful activities for little ones. Today & April 24, 10-11 am. Included with admission. For ages 5 & under; must be accompanied by parent. 2300 Expedition Way, La Jolla. www.aquarium.ucsd .edu/experiences/programs/toddler-time San Diego Gulls Home Games. See April 5.
the chAnce tO Succeed. Individualized speech-language evaluations & therapy for children at no cost to families nOw Accepting ApplicAtiOnS! Eggs & Goodies at Pacific Beach Recreation Center. Egg hunts plus family fun! 11 am-2 pm. $5 bracelet includes all activities. 1405 Diamond St. For details, call 858-581-9927. FREE Egg Hunt, Crafts & Bunny Photos in Linda Vista. 10-11:30 am. Linda Vista Recreation Center, 7064 Levant St. For egg hunt times, call 858-573-1392. FREE San Diego Writers Festival. This event celebrates writers of all kinds as it features workshops, live performances, educational panels about writing, book signings, readings, teen writing workshops and kid-friendly events. 11 am-10 pm. San Diego Central Library, 330 Park Blvd., downtown San Diego. www.sandiegowritersfestival.com Go, San Diego Sockers! See April 7. NEW – ESL classes this Summer! HURRY, SPACE IS LIMITED! Sunday kids & family classes in Balboa Park, La Jolla, and new Downtown location coming soon! NOW ENROLLING! Ages 2-Kindergarten M-F 6 A.M. – 6 P.M. Private Kindergarten M-F 8:30 A.M.- 3:00 P.M.
Calendar • April FREE The Port of San Diego’s Day at the Docks. Enjoy marine attractions for the whole family including fishing for kids plus boat rides on San Diego Bay, see displays by marine artists, attend how-to seminars by expert fishermen, test your skills at casting contests and more. 9 am-5 pm. Sportfishing Landings, Point Loma. www.sportfishing.org Don’t forget to call to confirm dates, times and admission prices. Little Learners Club: Little Artists. This early childhood enrichment class (for ages 18 mos.-3 yrs.) gives little ones the opportunity to strengthen their fine motor skills and expose them to art and creativity. Mondays, today until May 20, 9:30-10:30 am. The New Children’s Museum, 200 West Island Ave., downtown San Diego. Register at www.thinkplaycreate.org/learn/ family-classes/little-learners-club. Fun Academic Summer Camp? You Betcha! RVA’s full-time program serves students in grades TK-8, with classes based on ability rather than age. The summer program serves students in grades TK-12. Younger children explore cultures from around the world, including their history, science, mathematics, and literature. Older students select individual courses, such as Logic & Critical Thinking, American Sign Language, and / or Astronomy. Give your child an unforgettable Birthday Party with HANDS-ON animal interactions! Candle Making & Pottery Painting! Happen Every Day at San Diego Ice Arena! Explore BIG ideas at a small High School! ➤ Exceptional & Supportive Teachers Text Set4Life to 555888 for info. Calendar • April Easter Brunch Cruises by Hornblower Cruises & Events. Unlimited champagne and sparkling cider, delicious brunch selections and the Easter Bunny. 11 am-1 pm & noon-2 pm. Pier 1 Hornblower Landing, 1800 N. Harbor Dr., downtown San Diego. For reservations, visit www.hornblower.com. Easter Treats at Rancho Bernardo Inn. Brunch buffet with live music at Avant and Veranda Fireside Lounge & Restaurant from 11 am-3 pm, plus egg hunts and the Easter Bunny. For fees, egg hunt times and other details, visit website. 17550 Bernardo Oaks Dr., San Diego. www.ranchobernardoinn.com The Del’s Easter Celebration. Champagne brunch in the Crown Room or ocean view Ballroom with live music. Hotel and brunch guests can also enjoy egg hunts on the Windsor Lawn (registration required) and a petting zoo ($20). Hotel del Coronado, 1500 Orange Ave. Visit www.hoteldel.com for reservations. Chef Teri’s Easter Sunday Brunch. Plus Easter Bunny photos, arts and crafts, and egg hunts. 10:30 am-2:30 pm. $19-$79; ages 4 & under free. For reservations, visit website. Cape Rey, 1 Ponto Rd., Carlsbad. www.chandlerscarlsbad.com/easter Padres Home Games. See April 1. Easter Bash at Belmont Park. See page 35. Find Earth Day events on page 46. WIN wednesday | 24 Building Steam. Explore the emergence of the first public and modern railways, the railway mania and the end of the steam locomotive era. Through May 5; visit website for hours. $6-$11.50; ages 5 & under free with paid adult. San Diego Model Railroad Museum, Balboa Park. www.sdmrm.org Birch Aquarium’s Toddler Time. See April 10.
kids’ games, sumi-e brush painting exhibits, Japanese food and more. Today & tomorrow, noon-6 pm. Vista Buddhist Temple, 150 Cedar Rd. www.vbtemple.org FREE Linda Vista Multicultural Fair & Parade. 10 am-5 pm. 6900 block of Linda Vista Rd., between Comstock & Ulric Sts. www.lindavistafair.org FREE Day of the Child Community FUN Fair. Enjoy entertainment, face painting, dance contests, story time, games and more. 11 am-3 pm. Memorial Park, 3rd Ave. & Park Way, Chula Vista. www.chulavistacc.org FREE Mission Federal ArtWalk. See page 34.
offers 100 percent Spanish immersion summer programs for kids ages 18 months–7 years. Kids participate in music, arts & crafts, performances, water fun and more while learning to speak Spanish. Enter to win a one-week, themed summer camp at Little Language Ambassadors. Weekly camp programs run June 24 through Aug. 22 from 9:30 am-1:30 pm. Contest ends April 25. More fun happenings await at sandiegofamily.com. Want us to spread the news? Email jenny@sandiegofamily.com and include the name of the event or activity, a brief description, event address, date, time, cost, contact number and website. Submission does not guarantee publication. Deadline for the June issue: May 1.
am-3 pm. 7510 Hazard Center Dr., San Diego & 702 Center Dr., San Marcos. www.lakeshorelearning.com Nature & Me Story Time: Earth Day. April 11, 10:15 am. Free with museum admission. Recommended for ages 1-5. San Diego Natural History Museum, Balboa Park. www.sdnat.org Art Alive. See The San Diego Museum of Art in full bloom during this exhibition with nearly 100 floral interpretations of works of art. April 12-14, 9 am-5 pm. Also, visit the Garden of Activities (April 13 & 14, noon-4 pm) that offers a flower hunt, a floral-inspired art project for families, and a children’s reading area. Balboa Park. For tickets, visit www.sdmart.org. Parent’s Nite Out at Elite Gymnastics Academy: Earth Day. Kids, ages 4 & up, have a great time with gymnastics, games and lots of play. April 20, 6-10 pm. $20. Register online. 1817 John Towers Ave., El Cajon. www.elitegymnastics.com FREE Earth Day Festival. This celebration offers a plant and pottery sale, music, vendors and kids’ activities. April 27, 10 am-3 pm. Alta Vista Botanical Gardens, 1270 Vale Terrace Dr., Vista. www.altavistabotanicalgardens.org Creek to Bay Cleanup. Celebrate cleaner beaches, parks, rivers and trails at this annual event that beautifies more than 100 sites in the county. April 27, 9 amnoon. Register at www.creektobay.org starting April 1st. Summer at the Y is all about family, fun and coming together in active and healthy ways. We are more than a gym or a pool, we are a place where people belong and develop meaningful relationships through our numerous programs and activities. From group exercise to swim lessons to camp, youâ&#x20AC;&#x2122;ll find a safe, positive environment for you and your family to learn, grow and thrive. Join our community and discover your second home this summer. JOIN TODAY! ymca.org/SDFamily *Terms and conditions: Credit is not redeemable for cash. Promotion available from April 13 to 27, 2019. Membership must be purchased by April 27, 2019. Joiner fee shall be waived if purchasing a teen and young adult membership, in an amount not to exceed $25. YMCA reserves the right to withdraw or amend this offer at its own discretion. May not be combined with any other offer. Other restrictions may apply. Summer Camp and Programs Planning Made Easy!